Find your calling in one of Duquesne's nine schools. 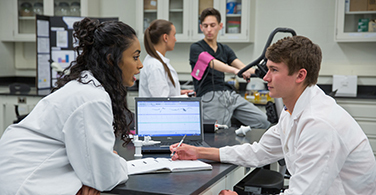 A 14:1 student-to-faculty ratio means attentive, supportive learning. Our faculty are among the best both in the classroom and in their fields. Students are active learners—processing, questioning, discovering. Duquesne emphasizes using knowledge in ways that improve the lives of others. 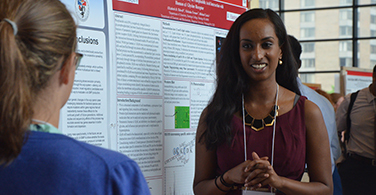 Students start their research careers early at Duquesne. Students can access a variety of academic resources to ensure success. 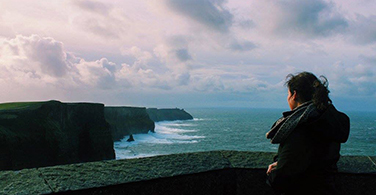 Broaden your horizons by studying abroad. Known for our commitment to providing an education that emphasizes not just intellectual growth, but also ethical development, a degree from Duquesne prepares you to make solid contributions in your field and in your community. A Duquesne education helps you to develop job skills, learn to think critically and come to better understand yourself and the world around you. Every undergraduate student in every school of study here at Duquesne takes a series of courses that emphasize intellectual and moral development through the study of the liberal arts. In addition to building skills for later success, this core curriculum allows you to study a wide variety of subjects and graduate with the richest possible academic experience. While studying at Duquesne, you’ll enjoy a low (14:1) student-to-faculty ratio, and in small classes, you get the personal attention needed to achieve your best. Most importantly, our faculty exemplify the ideal of the teacher-scholar. This means your professors are committed to providing an exceptional learning experience. They are top-notch teachers, but they also value and participate in scholarship and research, making important contributions to their fields. In fact, many students—both graduate and undergraduate—have the chance to assist their professors with research projects that are changing the world around us. The Carnegie Foundation even classified Duquesne as one of only seven Catholic universities in the nation with a “research university with high research activity” distinction. For the 11th consecutive year, Duquesne has been ranked in the top tier of the Best Colleges rankings. Duquesne ranked No. 40 in the nation in the Best Value Schools category, up two spots from last year. Duquesne ranked No. 80 in the Best Colleges for Veterans category. The A.J. Palumbo School of Business Administration was ranked No. 172 in the Best Undergraduate Business Programs category. Duquesne ranked No. 108 in the High School Counselor Rankings list. Duquesne named among the Best 384 Colleges, which only profiles about 15 percent of America's 2,500 four-year colleges. Duquesne again ranked as an outstanding value on the Best Bang for the Buck - Northeast list in 2017. On National Universities list, Duquesne ranked No. 134. Duquesne named to Best Colleges for Your Money list, which considers quality of education, affordability and alumni success. Browse baccalaureate, professional, masters and doctoral degrees and programs. Read about our nine schools of study. Take an online tour of campus. Are you a candidate for the Honors College, a rewarding challenge for academically gifted students? Explore Study Abroad programs, including our Italian Campus in Rome. Find out more about Academic Resources and Technology.